For three years, a team of scientists kept a big secret: They had discovered a giant crater-shaped depression buried beneath about a kilometer of ice in northwestern Greenland. In November, the researchers revealed their find to the world. They hadn't set out to find a crater. But in 2015, glaciologists studying ice-penetrating radar images of Greenland's ice sheet, part of an annual survey by NASA's Operation IceBridge mission, noticed an oddly rounded shape right at the northern edge of Hiawatha Glacier. If the 31-kilometer-wide depression is confirmed to be the remnant of a meteorite impact - and the team has produced a wealth of evidence suggesting that it is the discovery is exciting in and of itself. It's rare to find a new crater, let alone one on land that has retained its perfect bowl shape. "This is just a straight-up exciting discovery that starts with this wonderful element of serendipity," says team member Joseph MacGregor, a glaciologist with Operation IceBridge. But the crater - let's call it that, for the sake of discussion - may have also reignited a debate over a controversial hypothesis about a mysterious cold snap known as the Younger Dryas. This cold period began abruptly about 12,800 years ago and ended just as abruptly about 11,700 years ago. For more than a decade, a small group of researchers, unconnected with the group behind the new discovery, has suggested that a cosmic impact triggered the cooling Proponents of the Younger Dryas impact hypothesis say that the remnants of a comet exploded in Earth's atmosphere and that the airbursts sparked wildfires across North America. Soot and other particles from the fires blocked out the sun, causing the cold snap, which has been blamed for everything from the extinction of the mammoths to the disappearance of a group of people known as the Clovis. Most scientists reject that an impact was responsible, refuting the idea that there were vast wildfires at the time or that the Clovis people even disappeared. Another big objection: the lack of a smoking gun, a crater dating to the onset of the Younger Dryas. The “mammoth in the room,” therefore, is whether the Greenland crater might be that smoking gun. But a large, recent impact would be extremely unlikely, given the rarity of such impacts on Earth, particularly on land, says planetary scientist Clark Chapman of the Southwest Research Institute in Boulder, Colo., who was not involved with the discovery. Indeed, one sticking point is that there are no direct dates for the newly discovered crater, because it is still buried beneath all that ice. 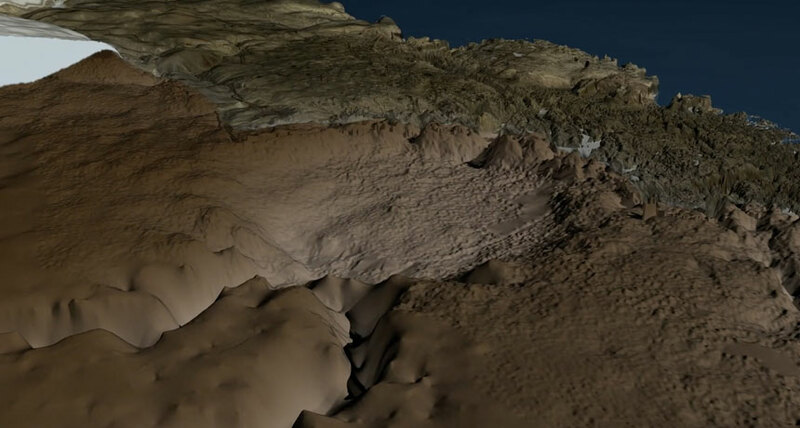 The radar data offer only tantalizing clues to the age, suggesting that the crater is between 2.6 million and 11,700 years old. That’s a huge time range, but the proponents of the hypothesis are convinced that this crater is what they've been waiting for. "I think it's transformational in terms of convincing a lot of skeptics," says James Kennett, a geologist at the University of California, Santa Barbara.